An evil monster of the dragon family that lives in Manon's Forest. 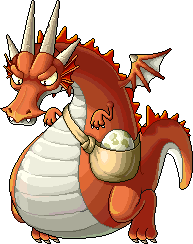 It is considered a high-ranking dragon, boasting various magic skills as well as high level of intelligence. Its physical strength also contributes to the challenge for adventurers battling against this monster, as it is covered by a firm outer layer and has a breath that can melt even the toughest metals. It can also fly using its small wings. The Manons had an amicable relationship with the Halflings, but for an unknown reason, they have become hostile towards one another.